The concentration of free electrons by the skin effect is possible with the help of an alternating current through a conductor. However, a conductor has hardly any energy consumption by itself so the power source must have a load to ensure a suitable flux of free electrons through the conductor. 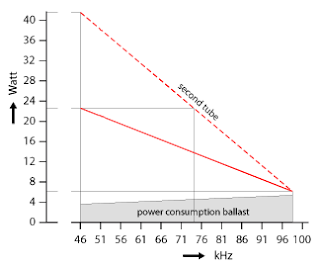 The image below (10) shows a lamp ballast of a fluorescent light tube and a dimmer to regulate the internal resistance by increasing the frequency from 50 kHz to 100 kHz. The 1 to 10 volt dimmer has an on/off push switch and turning the knob regulates the output frequency of the lamp ballast. The ballast is suited for 1 fluorescent light tube in the range from 14 to 35 Watt. The power consumption of the lamp ballast itself is about 4 Watt. 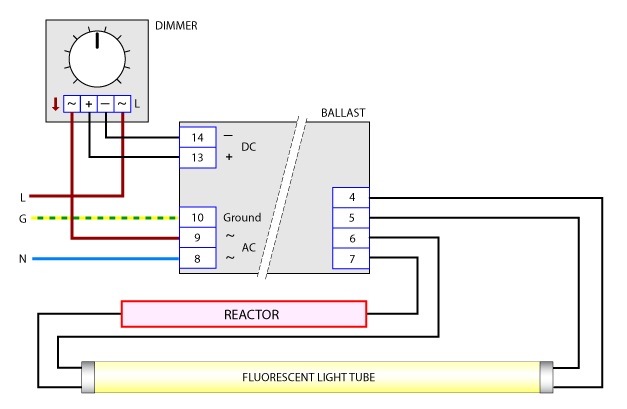 The skin effect inside the reactor can be established by connecting the electrical input and output of the reactor to an output line of the lamp ballast. This forces the free electrons to the surface area of the conductor by the electrons involved by the power consumption of the light tube. 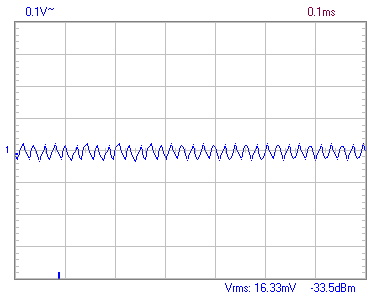 When I replace the zeolite/nickel mixture by a solid nickel rod I can measure the voltage and the waveform of the electric current that flows through the dummy reactor. In this way it is possible to observe the differences between the 2 configurations with 2 conductors (see “skin depth”). The outer tube is aluminium because it was impossible to buy a short nickel tube (only high quantities are available for industrial purposes). Figure 11 shows the “dummy reactor”. The direction of the electric current in both conductors is the same (configuration I). The other configuration (II) opposites the current in both connectors: B is connected to D and C is the output to the fluorescent light tube. The thickness of the skin depth is minimal when the current flows in opposite direction inside both conductors. However, there is another mechanism that can periodically concentrate electron waves with the help of elastic vibrations. To get these elastic vibrations inside the zeolite mixture the electric current has to flow in the same direction inside both conductors. The alternating current of the experiment with the dummy reactor (figure 11) was 235 Volt and the power consumption 20,5 Watt by 0,09 Ampere (inclusive the dummy reactor). The first test was configuration I (current in both conductors from left to right). 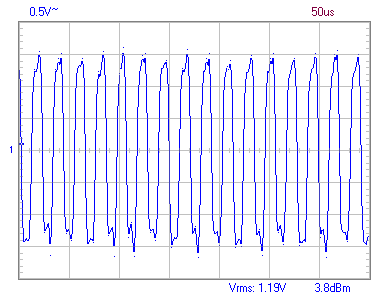 The image below (12) showed the diagram (oscilloscope). The measurement was done between the connections A and B (see figure 11). Configuration II – current in opposite direction – was tested in exactly the same way as configuration I. I expected a small difference between both diagrams because of the influence of the opposite direction of the current in both conductors. However, both are nearly identical. In other words: there shows to be no observable difference between configuration I and configuration II. Maybe that the next experiment with the "real" reactor will show some kind of deviation. 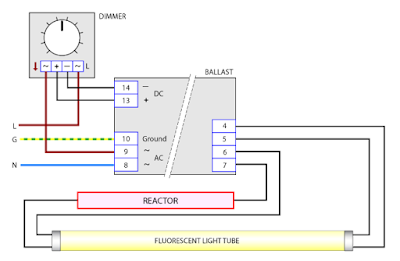 The reactor – filled with a 40% zeolite and 60% nickel powder mixture – is connected to the high frequency lamp ballast (see figure 10). However, increasing the frequency of the lamp ballast will decrease the power consumption because this feature of the lamp ballast is meant for dimming the light tube. The diagram below shows the power consumption in relation to the fluorescent light tubes (1 tube of 19 Watt or 2 tubes in series to get 38 Watt). Measurements during the experiment are done with the help of an oscilloscope (connected to point A and B in figure 14) and with the help of a simple glass tube thermometer (max 110 degrees Celsius), resting upon the stainless steel thread end. I have done a couple of measurements but there was no raise of temperature. The cause was not difficult to understand. The amplitude of the 50 kHz alternating current was decreased a lot in relation to the dummy reactor so I have to conclude that the skin effect was not optimal (see figure 15). Vrms is decreased from 1,19 V (diagram figure 12: dummy reactor) to 0,01633 V (nickel/zeolite reactor). It is a bit difficult to draw conclusions because the adjusted frequencies were not noted. However, the overall power consumption didn't differ much so the result is a bit awkward. After all, fusion of the hydrogen will produce oxygen atoms and there is a chance there is an explosion within the reactor after some time. I have to eleminate the risk before I try another configuration. Next chapter: "A hypothetical LENR reactor"